An teach ban is a modern, ground floor apartment offering comfort and privacy, beautiful river and mountain views, ideal to relax and unwind. It sleeps five, consists of two bedrooms, bathroom, kitchen and sunlounge / living room leading out to patio. There is an all-the-year round BBQ hut, which can seat 12 people so you can enjoy your bbq whatever the weather! As it is a ground floor apartment all on one level it is suited to those visitors with limited access mobility. Being on an elevated site there is beautiful scenery of the surrounding countryside. 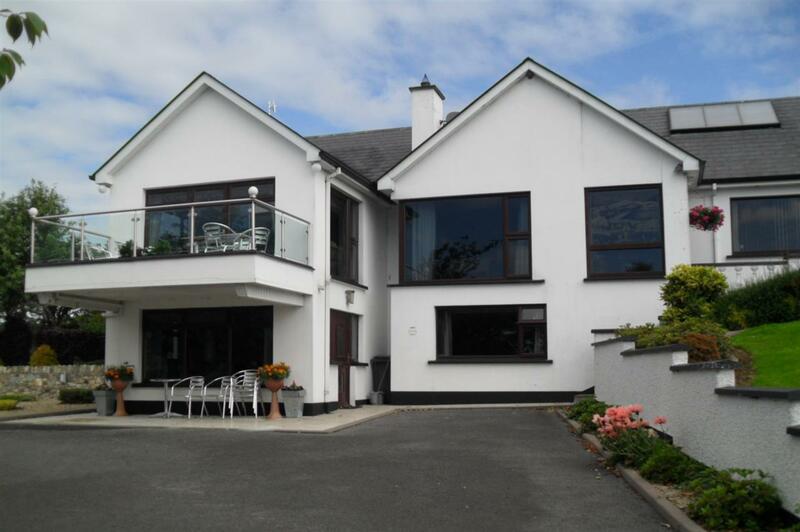 It is situated approximately 14 miles from Omagh and Cookstown, and 2.5 miles from An Creagan Visitor Centre. There is the local Costcutter shop, Post Office and pub within 1 mile. It is a secure child-friendly location with a slide, swings and climbing frame. There is an equestrian centre nearby. An Teach Ban is centrally located in Northern Ireland and hence easy access to many tourist attractions.Locally it is close to the historical sites of the Ogham Stone and Beaghmore Stone Circle and the visitor attractions of Ulster-American Folk Park, Gortin Glens, An Creagan Centre and Drum Manor Forest Park. The walking and cycling routes of the Sperrins are nearby as well as golfing and fishing facilities.